Beyoncé has announced that she will be back touring the UK & Ireland again in 2014, during the second European leg of 'The Mrs Carter Show World Tour'. The American superstar is set to perform concerts in Glasgow, Birmingham, Manchester, London and Dublin next year. These new UK & Ireland shows are expected to precede the release of Beyoncé's forthcoming fifth studio album, which is rumoured to be released in the spring. The first European leg of the 'The Mrs Carter Show World Tour' took place in the spring of 2013, and was critically acclaimed. 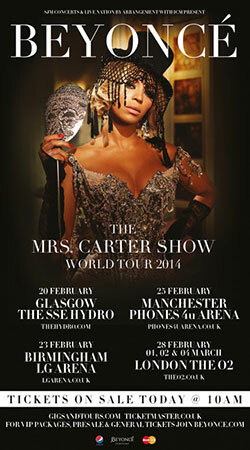 Tickets for Beyoncé's 2014 UK & Ireland shows will go on general sale at 10am on Monday 16th December.